Senate Republicans are moving forward with an extremely unpopular proposal to upend the Affordable Care Act – and they’re doing it in the most secretive way possible. Despite the fact that they still haven’t published their bill, legislators want to push through a vote before July 4. Regardless of your political opinions on health care, the Affordable Care Act or Republicans, rushing major health care legislation through without due consideration is wrong. It’s imperative that you act, and we’re going to show you how. In a hurry? You can skip right to the action section. Following the election of President Barack Obama in 2008, Congress embarked on an ambitious and lengthy project to reform health care — one of the president’s key campaign promises. In committee, it took months to fully develop and mark up the bill that eventually became the Affordable Care Act. The effort entailed hours of debate, and the bill was made available for review by the public. Ten “essential benefits” that insurers must cover, such as mental health and pregnancy, with a ban on annual and lifetime coverage limits for these benefits. A ban on denial of coverage on the basis of preexisting conditions. A radical expansion of Medicaid, the program that extends health coverage to millions of low-income Americans. Under the Affordable Care Act, 20 million people got insurance in participating states. Restrictions on “market rating,” the practice that allows insurers to charge differentially on the basis of age, gender, location or other factors. The ACA allows geographic and age-based differential pricing, but restricts the amount of pricing variance. Dependents up to age 26 can remain on their parents’ health insurance. Rescission, in which policyholders are dropped because they get sick, is banned. Certain preventative services, including mammograms, colonoscopies and annual exams, must be covered with no charge. Employers with more than fifty employees must provide health insurance. Certain high income earners face moderate tax increases, as do pharmaceutical companies. Americans are subject to the individual mandate, a requirement that they carry health insurance coverage, with several standardized tiers of coverage available for people with different needs. Republicans have threatened to repeal and replace the Affordable Care Act in every campaign cycle, and President Trump made doing so a cornerstone of his campaign. The good news: Republicans don’t have the votes to repeal and replace the Affordable Care Act. The bad news: They can use a process called budget reconciliation to selectively strip key provisions of the ACA. In the short term, this will have a tremendous impact on many health care consumers, and in the long term, it will cause the ACA to collapse by defunding some of its most important aspects. In May, the House passed the American Health Care Act by a narrow margin after moving it very rapidly through committee and a floor vote. The Congressional Budget Office estimated that the legislation would reduce the deficit — the stated goal of conservatives — and that by 2026, 23 million people would be uninsured. Now, the Senate is working on its own version, but GOP leaders are refusing to release a draft bill for public review. Additionally, the bill hasn’t yet been scored by the Congressional Budget Office, which evaluates the fiscal impact of proposed legislation. Because it’s a reconciliation bill, it just needs a simple majority — 51 votes — to pass. A repeal of the Medicaid expansion and deep cuts to Medicaid. Changes to the tax credit system used to help people buy insurance. A waiver system that would let states lift restrictions on ratings, with older adults potentially paying a lot more for health insurance. A blow to the ten essential benefits by allowing states to waive that coverage requirement. Policies making it functionally impossible to obtain abortion coverage on an insurance plan. Elimination of the Prevention and Public Health Fund, which works to improve the quality of public health in the U.S. While insurers wouldn’t be allowed to ban or drop people with preexisting conditions, in states that applied for waivers, they could redefine and charge more for coverage. That would make it expensive and difficult for someone to get coverage with a preexisting condition if they’ve allowed a policy to lapse and they need care again. Changes to pricing could also push people off a policy by making it unaffordable. If the Senate version passes, the bill will go to a conference committee that will negotiate over the differences between the two bills and develop a single, streamlined version. The House and Senate would need to vote on the finished bill before it could be sent to the White House for signature or veto. Th bottom line? 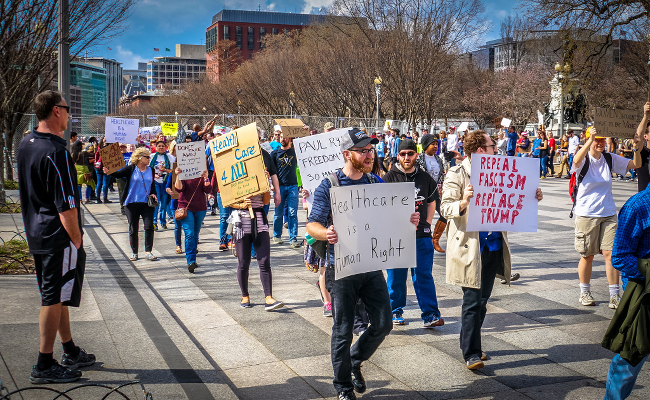 Many Americans believe the Affordable Care Act needs reform and that the U.S. has some significant health care challenges, regardless of party. However, conservative legislators are rushing the AHCA through without careful consideration or attention — and that could have devastating results for the future of health care. Voters across the country have turned out to town halls to make their voices heard, even though their representatives sometimes don’t show up — or try to stop proceedings early. The majority of voters in the U.S. support the Affordable Care Act and oppose the AHCA. Contact your senators. If you can, call them. You can also visit their district or Washington, D.C. offices, fax them or send them snail mail. Be sure to include your full name and address to be counted. You can find contact information on the Senate website. Only call your senators: Out-of-state callers cannot be counted, and they block access for legitimate constituents. Instead, pledge to phone a friend — or three — when you’re done calling to encourage them to contact their elected officials. If you’ve never called elected officials before, don’t worry! It’s a straightforward process, and you can rally some friends to do it as a group if you’re feeling nervous. Your senators work for you, whether or not you voted for them. By calling local district offices, you can also connect with someone close to your community who will understand where you’re coming from. Democrats have broadly said that they stand against the bill and intend to vote in opposition. However, it’s important to call and affirm your support for that choice — and to share your story. Democratic senators will use what you tell them in conversations with colleagues, and they may talk about examples from their constituents while speaking out on the floor. Keep your remarks brief, but personal. Consider issues relevant to your area and your senator’s stated values and think about including a remark that references them. I would like to thank the senator for her opposition to the American Health Care Act. The Affordable Care Act has allowed me/a family member/a loved one to obtain health care for a chronic medical condition/a serious illness/a healthy pregnancy and that would not have been possible before. It’s important to me to retain access to health care for all Americans, because health care is a human right that also creates economic and social opportunities. I know that economic recovery/health care excellence/small businesses are important to the senator, and the ACA supports these goals. While the GOP likes to claim it has a united front, some Republicans have expressed concerns about provisions in the AHCA, as well as the lack of transparency. They include Lisa Murkowski of Alaska, Rob Portman of Ohio, Shelley Moore Capito of West Virginia, Susan Collins of Maine, Lindsey Graham of South Carolina, Jeff Flake of Arizona, Dean Heller of Nevada and Cory Gardner of Colorado. In other words, don’t assume your senator(s) support the bill! Start by asking the staffer for the senator’s position on the bill. If the staffer indicates that the senator hasn’t taken a position yet or is still weighing things over, tell them you hope the senator will consider taking an opposing stance. Again, stay brief, but personal — and appeal to the senator’s known political positions. You can use this overview of the impacts of the American Health Care Act by state to customize your call. I’m disappointed to hear that! The lack of transparency surrounding the bill concerns me, as I think everyone should have an opportunity to read it before bringing it to a vote. I know the senator cares about the welfare of her constituents, and I hope she is considering the economic impacts of the AHCA, as well as the number of people who might lose insurance coverage under the bill. I would also like the senator to know that I/a family member/a loved one has been able to access health care for a chronic condition/serious illness/emergency because of the ACA, and I don’t know what we would have done without it. Humanize yourself to staffers so they can put real names and stories to abstract figures. If your senator supports the American Health Care Act, let them know you’re not happy about it. Remember that staffers aren’t responsible for their senators’ positions, so stay friendly, even if you’re feeling impassioned. I’m sorry to hear that. I was hoping that the senator would change her mind after seeing so many public health and medical organizations warn that the AHCA could be very dangerous for the welfare of millions of Americans. I’m worried that I might lose my health care coverage, or that changes to my coverage would make it hard for me to get care for my diabetes/pregnancy/chronic illness/etc. I’m also concerned about friends, family, and community members who are benefiting from the Medicaid expansion and other important provisions of the Affordable Care Act. Please ask her to reconsider the fiscal and public health effects of this bill, especially in light of the fact that Republicans are refusing to make it available for public review. I am concerned that the lack of transparency and short timing means that some senators may be voting on a bill they haven’t had an opportunity to read and carefully consider. And remember, your voice matters in protecting accessible and affordable health care. Add your name to this Care2 petition to demand that the Senate brings the bill to the floor for public debate! Do you think if you post something often enough it changes the facts? I honestly think you are a very troubled individual who is either 15 years old or perhaps in your very "golden years" with memory deficits.. I guess just attention seeking IS the motive. Obama promised to give us single payer universal healthcare when he first ran for president, and lied and gave us Obamacare, that although was a step in the right direction, was still way short of what we needed, which was Medicare for All. Even now, Obama refuses to support the Conyers HR 676 Medicare for All bill, which Bernie Sanders supports, so Obama is a sellout and a liar like most of the corporate Democrats and republicans, who are refusing to support HR 676, the Conyers Medicare for All bill that we desperately need in this country. I give Obama credit; he tried where for decades politicians just talked. I think he had more support on than he ever knew while he was in office. The ACA was flawed, but this AHCA sounds like a real loser. I have healthcare at work, but that's not true of everyone I care about. Even if you could get the Republicans and the Democrats to agree on a single-payer plan the transition would still be rough. At this point, all that exists are estimates, projections, best case scenarios, and worst-case nightmares. I would like health care for everyone even if it means less for me. That is I would like coverage for all, but I don't trust the government. I don't trust these corrupt a$$holes to run government health care with the best interest of the citizens in mind. Before the ACA, the US was the only industrialized nation without a "health plan" for it's citizens. It wasn't ideal but it DID allow some to actually visit their or at least A doctor for sometimes the first time and get treatment or at least a diagnosis. Using the Emergency dept in hospitals is probably one of the most expensive ways of providing care and NOT a long term solution. Your system is the most expensive because so many of you think it's OK for privatization of hospitals, pharmaceuticals and services is the only way to go. You can call other countries "socialist" or whatever but at least we take into consideration ALL citizens. Do we have some problems? you bet we do but what you do is the worst way of delivering care UNLESS you have a health plan with your work or you are very wealthy. Of course both sides "do it" It has become your way of governing . Unfortunately it rears it's ugly head here in Canada too. A well, healthy population is better all around for productivity and social programs not being needed. If you are proud of how the US delivers health care or how THIS plan is being jammed in or the cost or any number of other things then you won't question it because probably you are not one of those "others" who will be without the means to be healthy. Are you implying these fine legislators are not serving the best interest of their constituents? I would agree. In the best possible light, these contributors see the candidate's views aligned with their interests. In truth, they are buying access if not obvious influence. This Maplight site is interesting, but their data source is Opensecrets.org. If you start looking around at open secrets, you will find a lot of people getting money from these health care and pharmaceutical donors. One of the presidential candidates, in particular, got far more money than anyone else though her campaign was unsuccessful. People don't like to hear that "both sides do it" but both sides do. So instead of having an honest debate about healthcare we have a Republican plan vs. a Democrat plan. I would be willing to bet the interests of those corporate donors get served either way. After all, they give to both sides. ACA or AHCA either way, we still have the world's most expensive healthcare while failing to insure everyone. We have to remember that TURTLEMAN McCONNEL'S wife work's for TRUMPY and that is MO-MONEY for His Pocket!! He is so SELFISH like TRUMPY!! his is a Great Article it brings the attention to all this is EVIL AND VERY CRUEL!! Everyone call your representatives and Senators's. ASK them how they can do this to the people of their own Districts and the one's that had Voted to put them in Office! FLOOD THE -EMAILS AND PHONES' KEEP IT GOING TELL ALL YOUR FRIEND'S PASS IT ON BEFORE IT'S TOO LATE! WE NEED UNIVERSAL FOR ALL THE USA IS THE ONLY ONE'S THAT DON'T HAVE IT LIKE THE OTHER COUNTRIES. Remember who had made this out and Vote them out at the Polls! The average contribution between all the senators was $214,000 with Hatch getting the largest share, tom Cotton $29,911 and even Ted Cruz receiving $58, 895. This was from health insurance companies and pharmaceutical companies..